These two verbs are very often confused by English students because they are similar in meaning; however, they are used differently. 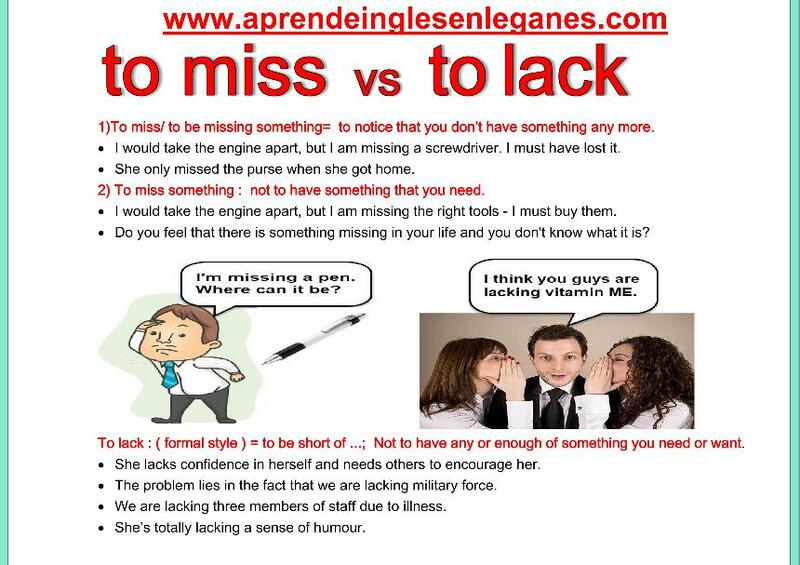 We use "miss" to mean that we do not have something anymore (i.e. we have lost something) or to mean that do not have something that we need. I guy bumped into me a while ago and now I'm missing my wallet. I think I've been robbed. The staff are their best assets, but they are missing the proper tools to succeed. We use "lack" when we want to express that we do not have any or enough of something. John is a good engineer , but he lacks experience in this area. UK employees feel they are lacking basic skills compared to their European counterparts. In the picture below, you will find some more examples that will help you to better understand how to use these two verbs.